This is an album which is kind and soft to the listening palette. There is never a need to turn down the volume, highlighted by opening song ‘Last Summer’, which he features Shields. It’s ambient, mellow in tone and awash with cushioned beats and tingling shards of electronica, but things start to get a bit more interesting when he ups the pace a tad and less-than-subtle nuances start to begin. The drums start to pounce a little harder and a cultured assemble of controlled but layered arrangement makes for a clipped but steady start to the album. The second piece ‘Ozu Choral’ is much terser and sedate. Stripped of all the instruments which made ‘Last Summer’ so big, it’s its antithesis and a throwaway track as it meanders down the only route suitable for it: supermarket shopping at 3am in the morning. This album in parts reminds me of Ultramarine, who delivered an earthy, spacious electronic take on the genre peaking with their 1993 album United Kingdoms. But I must stress it’s only in parts, as Reitzell seems happy to wallow in the zonked-out, post-dope-smoking comedown personified by the rather too long ‘Gaudi’. In fact, throughout Auto Music it’s only in spikes that there is a time-shift in pace. The shiny newness of ‘Auto Music 1’ has a huge chunk of Kraftwerk indebted to it but still comes up short because it really needs an injection of speed and energy. ‘Beehive’ is another filler track and limply delivers nowt. It’s like somehow Reitzell doesn’t want to conform, doesn’t want us to buy his album. It’s idiosyncratic and meaningless and dribbles out to a sad, almost maudlin finale. There is some redemption in his heart on the fluffy ‘Oskar’, with its exuberant chimes and revved up BPM. It’s what Jean Michel Jarre might do after taking a shedload of acid. 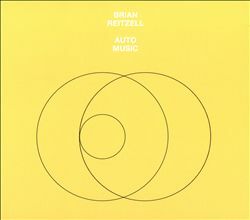 There is no doubting Reitzell looks through the glasses of the avant-garde, but his narcissistic take on ambience may be too much for an audience who aren’t quite ready to climb into their bed just yet. I was a bit disappointed by this as well. Feels a bit like a load of leftovers from his soundtracks.